In this paper the possible effects of MARPOL Annex VI revisions on the shipping industry have been analyzed with a focus on the impacts of the rising fuel costs on maritime freight rates. Requirements of the Marpol Annex VI and its applicability through time have been explained and specifications of marine fuels, bunker consumption of different ships and some technical applications are broadly analyzed in line with the annex. Impacts of future fuel cost rises on maritime freight rates are analyzed in two different markets. Aframax, Suezmax and ULCC/ VLCC spot rates, dry bulk commodity spot rates, such as; iron ore, grain and coal spot rates are analyzed with multiple linear regression analysis under various models. 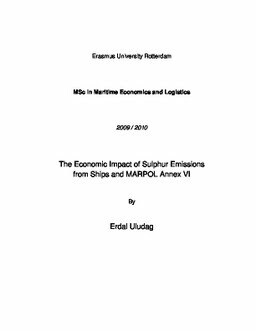 The fuel switch cost increase estimations depending on timelines and different sulfur contents are made in line with the average results of the currently available relevant literature. Although, there seems to be a significant cost increase, the reflections of the percentages on the freight rates are estimated to be slightly different on different markets. Dry bulk commodity spot rates are estimated to reflect the increase of the fuel costs on the freight rates with the highest levels up to 44%. Tanker spot rates are estimated to rise considerably lower with values varying between 0.9% and around 3%.